You will mostly be using the Kanban view to see all your records according to their stages in the sales pipeline, and this happens by default. But did you know that you can also create your own view for any module based on how you want to categorize your records, based on pick-list type fields? Say you own furniture stores spread across three different locations in the country, and you want to see how each store is performing with regards to the kind of deals that you are getting and their total revenue. You can set up a Kanban view for this. 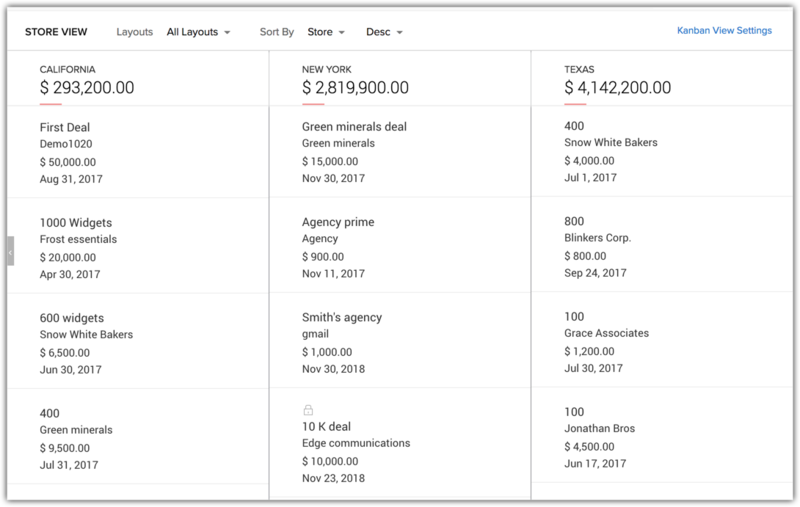 All you need to do is have a custom pick-list field for Stores in your Deals module. Customize your Kanban view from the Kanban view settings and choose your "Categorize by" and "Aggregate by" fields. Tada! Now your Kanban view will have details of the three different stores along with their expected revenue. Similarly, you can create your own categories for your Zoho CRM records, using only the pick-list fields.